This is Part 2 of my Ocular Diaries (you can read Part 1 here). If you’re reading this for the first time, the short of it is that I’ve been successfully improving my short-sightedness (myopia) by using progressively weaker lenses. Here’s my progress in a neat little table. Over a period of about three years, my vision has improved by 3.00 (left eye) / 3.75 (right eye). As I did in Part 1 of this series, I’m using my journal entries because there’s a step-by-step progression to my improvements. The following journal entries are in chronological order — with earlier entries at the top and my latest update at the bottom. Good progress on my vision with these new glasses. I’ve moved my monitors at work back to their original position now as the screen became sharp again. My monitor at work is quite blurry with my 5th pair on so I’ve had to pull it a few inches closer to me. It’s not ideal but I can work. For the past month or so, my eyes just feel more tired than usual whenever I have glasses on. So much so that it’s such a relief when I get to take them off. I think I’m more sensitive and physically aware to the fact that whenever I have glasses on, my eyes have to work and focus and strain, and that without them, my eyes (and my mind and myself) immediately relax and let go. I spend more time now wanting to feel comfortable and relaxed, and less time feeling the need to see things clearly. I’m still on my 50mg maintenance dose of Iodoral + 3-4 mag chloride pills + high-dose Vitamin C a day regimen. My serrapeptase stockpile finished a while ago and I decided to try nattokinase as well. So far so good. I also just started taking probiotics more regularly. I’ve taken them on-and-off in the past, but am now starting to take them a few times a week instead. Let’s see what happens. Got my first shipment of 3 new pairs. V excited. I’ve started my 6th pair of glasses today. It’s the much-awaited -2.50/-1.75, which means I’ve officially broken through to the 1.0 mark (well, for one eye at least). My vision with this 6th pair has been slowly getting sharper. The operative word here being slow. I sometimes feel like I can’t wait to jump to the next level, and then when I realize I can’t yet, I get disappointed. But a bit later, I’ll realize that’s a silly way to think, I mean, this isn’t the amazing race. As an aside, I recently bought a cheap pair of Aviator frames online, fitted them with my -2.50 / -1.75 prescription and added an 80% amber tint. Voila! My very first pair of “DIY” prescription sunglasses. Before this, I’d sadly given up on the idea of wearing sunglasses, so I’m really happy I got them for my upcoming summer holiday. I would never have bought them if they waren’t so cheap. Total cost excluding shipping was $11.90 ($6.95 silver Aviator frames + free prescription + $4.95 80% amber tint). If you need prescription sunglasses and you’re on a budget, I highly recommend this. I’ve had more progress that came inadvertently. I went in for wisdom teeth surgery on 16 March and was given a week off from work so I’ve been recuperating at home (it was a bad one, I had both my left/right lower wisdom teeth out and the dentist had to remove some jawbone on both sides to do so). Without work, ive been using the computer much less (and not at all some days) so ive been going without my glasses completely much more often and for longer periods of time. Also I had no idea wisdom teeth surgery would be so exhausting. I spent the first few days mostly sleeping or lying in bed. The good news is this that when I finally felt well enough to turn on my PC, I found I had to move my monitor back an inch because the screen was too sharp. Yeah!!! I admit it, I’ve been pretty lax about my eye exercises. As in I haven’t been doing them. At all. It’s been a crazy year and I’ve got so much other stuff going on that this little experiment has taken a backseat without me even realising. Or maybe it’s laziness. Or a bit of both. Anyway, today I suddenly realised that this is unacceptable. So I bit the bullet and downgraded to my 7th pair (-2.25/-1.50) today. I’ve been so out of it that I actually forgot the power of my current lens — I had to open up this diary and read the last couple of entries to find out. Not good. 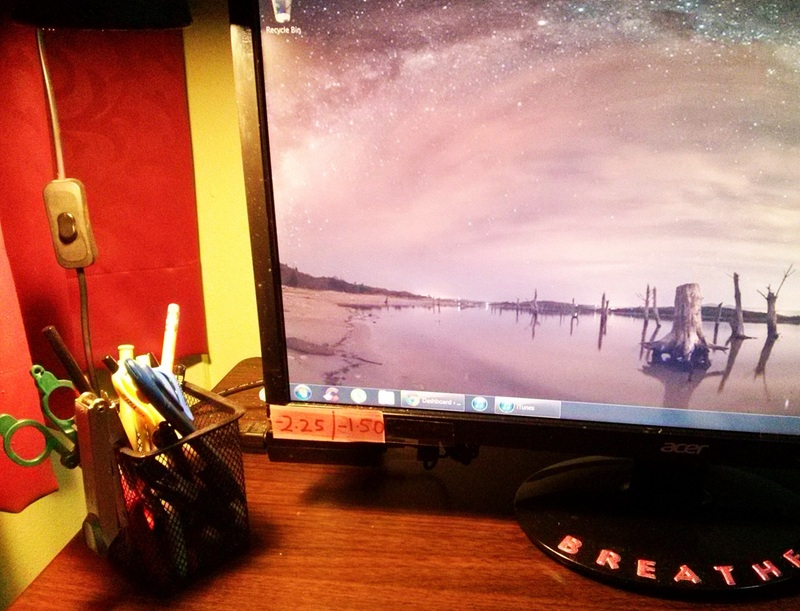 A simple fix — I pasted a post-it note with my current prescription on my monitor. Now I won’t just forget, I’ll be more motivated. Things are generally blurry as I walk around my apartment with my 7th pair of glasses — it’s all indistinct and fuzzy edges. But I know my sight will sharpen as I continue to wear these new glasses. I’m feeling good. I’ve been doing much better since my last entry. Or at least I’m finally back to making healthy changes. You see, my workload has increased quite a bit this year. I’ve gone from working 9-hour days with a good lunch break to 12 hours of working, and lunch is shoving food in my mouth as quickly as possible so I can get back to work. I rarely take breaks or remember to. It was scary to notice just how much time I’m spending staring at a screen each day. Many days I’ve been so tired after work that I just go to bed immediately, without any downtime to relax. That is not sustainable because I’m not Supergirl. So I’ve been purposely slowing down and taking more breaks + resting my eyes during the day. I’m very lucky that I can work from home, which means I can do some unconventional things like going into a ‘downward facing dog’ pose a few times a day. It really feels good for my head/brain and my poor tired eyes. I also remove my glasses when I do some things like cooking (unless I’m handling a knife). Supplement-wise, I’m still taking iodoral, magnesium cloride and Vitamin C.
I’ve also been taking eyebright recently (an herb) and I’ve just ordered lutein pills. Eyebright seems to make my eyes feel better during long days, and I’m hoping lutein will do something too. It’s still not an ideal situation since I’m spending copious amounts of time in front of the computer (no way around that). But I’m so glad that I’m doing it wearing my low-powered glasses. I can’t imagine how much more tired and strained my eyes would be had I been wearing my full-powered glasses from way back! I’ve made the leap down to my 8th pair of glasses today (-2.00 / -1.25). Things are blurrier, but it’s not as bad as I’d expected. I just moved my monitor up by 1-2 inches and things sharpened up enough again. But now that I’ve done it, I have to wonder — what was it that I was so afraid of??? Yup. It’s been more than 6 months since my last entry. What can I say except I’ve been working longer and longer hours this year. And rest has been an elusive thing. With more demands on me at work, I’ve let all the good eye care habits (resting my eyes, taking breaks) fall mostly by the wayside. The only real and mostly consistent breaks I give myself are about half an hour each evening when I take my glasses off and watch the evening sky outside my window. Yet today I change my glasses to -1.75/-1.00. And for once since this great experiment started, this isn’t by choice. I’d accidentally scratched my older pair too badly for me to see clearly through anymore. And I refuse to go backwards and use my previous pair of stronger glasses, so I downgraded and moved my monitor closer to me. Surprisingly (or not? ), since I was forced to downgrade my glasses, my vision has improved quite a bit! I been feeling that progress has been coming very slowly this year, but for some reason, I’ve gone over the “hump”. I’ve been taking lutein pills (and then eyebright) daily. Both are eye-strengthening natural supplements. And I’ve also discovered something that’s made me quite giddy with happiness — I can read and write text on my monitor without glasses! I need to zoom my browser to 150% in order to do this, but that’s my default setting anyway with my weaker glasses. I’ve always felt unconsciously/consciously beholden to my glasses whenever I’m at the computer (which is all the time), so this discovery is very free-ing to me. Plus, I know from all the literature elsewhere that progress comes fastest when you go without glasses completely. Yeahhh!! Amazingly today, I’m switching to the very last pair of weaker glasses that I have on hand, which is -1.50/-0.75. I’m going to have to place an order for my next set soon. That makes me really happy because I’ve had my current batch for ages! It feels like progress again. And I’m attributing this to my last recent discovery — that I can use the computer without my glasses at all. This one thing has made a sea change. I still wear my low-powered glasses for some things, but more than half of the time, I have them off while I’m at the computer. And my eyes thank me because they feel great when I’m reading without my glasses — no strain, just a natural and pure relaxed state. So this has been my much long-in-coming update. When I look back, I can see that it’s been full of stops and starts, but in the end I managed to get further down the path (somehow). And as with a lot of things, the biggest obstacle proved to be me and my own fears, rather than anything external. This is the end of my post here for now. If you’re like me, and you have myopia and want to improve your vision naturally, I hope I’ve given you some ideas to go on. In the meantime, I’ll continue journaling and keeping track of my progress. I plan to update with Part 3 sometime in the future, so stay tuned! This is Part 1 of my Ocular Diaries. Follow me on my experiment as I attempt to improve my myopia by using progressively weaker lenses. I had wisdom teeth surgery in mid-March 2013. I share my experience during the surgery itself, and how I healed over the subsequent days and weeks. It was not a fun experience, but I thought sharing it could help others. Nate from Canada here (but residing in Hong Kong). Just want to say thank you for posting about your personal experiments with gradually improving your vision through progressively weaker lenses. I must say, reading your findings has inspired me to do the same (especially seeing how similar our prescriptions are, mine’s L/R -4.75 and -4.25 respectively and with moderate astigmatism). I was just wondering if you think all of your progress would have been possible without eye exercises or supplementation? As in, do you think it’s possible to to achieve these results with just the lenses? I’m considering attempting this with contact lenses because I wear those more often. In any case, best of luck with your continued progress and I look forward to Part 3! I think using weaker glasses alone are enough to lead to eyesight improvements. I believe the supplements I take are supportive, but not strictly neccessary. And I don’t know if weaker contact lenses will work the same way, but you could give it a try with one disposable pair first and see how it goes? I’d be interested to hear how you get on with them too. Thanks for writing and sharing such an interesting and informative chronology of your eyesight improvement program. I hope your eyes continue to see well for years to come! I stumbled upon your articles by doing a search for “iodine” and “serrapeptase,” just to see what this combination might return. Two-and-one-half years ago I contracted Lyme disease, and a couple months later began to take serrapeptase after a major relapse (and during my third round of antibiotics). The serrapeptase enzyme, combined with doxycycline, worked much better at clearing symptoms than the antibiotic alone, and later the enzyme by itself worked at least as well. I have not taken antibiotics since, but have continued to utilize serrapeptase, with the added benefit of significant improvement in my sinuses. A year ago I began taking Lugol’s solution (5%), starting at one drop and building up very slowly while I read two books on iodine. I am now at 4 drops (25 mg) twice a day, feel very good and have had no particular detox reaction, even though I have not done the “salt-loading protocol.” I have taken Armour Thyroid for about forty years, and I have recently been able to cut my dosage by 25% (working with my doctor). With that said, I would like to share my own eyesight improvement program. In third grade (age 8), I was taken to an optometrist to be fitted with glasses for myopia. At the time I was pretty compliant, so you can guess the rest of the story. By my teenage years I wore very thick glasses, and hated them. A close friend used contacts, but the “hard lenses” of the day bothered his eyes and he could only wear them a few hours per day, so I never considered that option. In my late teens or early twenties, a reprint was issued of The Bates Method for Better Eyesight Without Glasses, and I ordered and read it with enthusiasm. I attempted the exercises, and went without glasses as much as possible, but I soon found my sight was so far gone that I could not function very well. I did have a few glimmers of hope when my unaided eyes would focus clearly at a distance, but these fleeting moments came too seldom, and I finally gave up. I later read Sight Without Glasses, by Harold Peppard, which kept the idea alive. The world of work ended up putting me in a tractor trailer, and I soon found my thick glasses created great difficulty in backing a trailer and with depth perception in general. Shortly thereafter I learned of soft contact lenses, and decided to give them a try. After my initial frustration trying to put them in and take them out, I found that my eyes adapted to them well. They solved a lot of problems, such as improving depth perception and ending distortions caused by astigmatism, eliminating irritation to my nose and ears from frames that would not stay in position, and remaining clear when coming inside on a cold day! So for many years I have used contacts, faithfully taking them out every night. My prescription kept steady for a long time with one eye at -8.0, the other at -8.5. As I entered my 40s, I had very minor problems with close work under low light conditions. In my early 50s, my current optometrist reduced the prescription for my weak eye to -8.0, which cleared up any reading problems at the time, and also left my eyes “balanced” for the first time in years. As time went on, I did have a little near-vision blurriness return, and asked to go down to -7.5 for each eye. The doctor agreed to a trial, and it worked very well. Since then I have been working down to the next weaker prescription as I can, while still maintaining adequate vision to drive safely. I am currently at -6.5 in each eye and seem to have plateaued here for a while. I had my DOT physical a month ago and tested at 20/20 for distance in each eye. With contacts, I can still read fine print easily in good light, and most print in lesser quality illumination. I have never used reading glasses. At age 61, I cannot say that the improvement in my eyesight was not influenced by other factors, but I think my deliberate lowering of the prescription has moved it in a positive direction. Your story has confirmed my findings, and I hope by sharing this lengthy comment with you, that I am confirming yours. I also think diet and overall health play a big part in this picture. For forty years I have done my best to stay away from processed foods and restrict sugar intake especially. I am omnivorous, and have eaten lots of real butter and eggs and cholesterol-laden foods for years, but also eat more vegetables than some of my vegetarian friends. I get moderate amounts of exercise, but can easily walk two miles if need be. My hearing and teeth remain in very good condition, too. Other than Armour Thyroid, I take no prescription medications. Thanks again for this great article! Thanks again Bill for sharing your own experience 🙂 I’m sure it’ll help many others. Sorry it took me so long to reply on the site, things have been pretty crazy for me recently. in order to get rid of my myopia that makes my life very sad. At the beginning, I took 6 pills (12.5mg each) a day for a single month. I did a break for 3 weeks and then restart taking 3 pills a day in addition to serrapeptase till now. However, since I started iodoral, I have some hot flashes during the day. Did you have this kind of symptom? I’m a little bit worry about it, don’t want to put my health at stake! Do you still take iodoral pills today or you fully recovered your eyesight? Do you think If I reduce the daily intake down to 2 or 1 pill/day, it would still works? I never got hot flashes, but everyone’s side effects will be different. So it’s always better to listen to your own body. Like you said yourself, you don’t want to to put your health at risk. Most people who decide to supplement with high doses of iodine know why they’re doing it and what to expect. It’s just not a step to be taken lightly and requires doing your own research. I still take iodine daily but just a lower maintenance dose for my own general well-being. During your high iodine intake regimen, did you notice something working in your eyes, I mean, some “titillate” feellings, something like that. Can you see clearly now Sam? Did you finally kiss your glasses goodbye? No, there’s really no sensation. As I described in my post, I only found out about my improved vision after going to the doctor and the optician for an eye test. I wouldn’t have realised it without their help. I still don’t have 20/20 vision, but I’m fine with it. I’ve been able to read/work on the computer without glasses for a long time now (because of the progress I’ve gotten so far). That alone is a big help to me personally. Hope you don’t mind, but if you have any more questions about iodine usage, it’s better to take it to online forums that focus on that. I’d rather not emphasize iodine’s role in my own eyesight improvement — in fact, I’ve made a particular effort in trying to warn readers about it and to take personal responsibility if they go down that route.